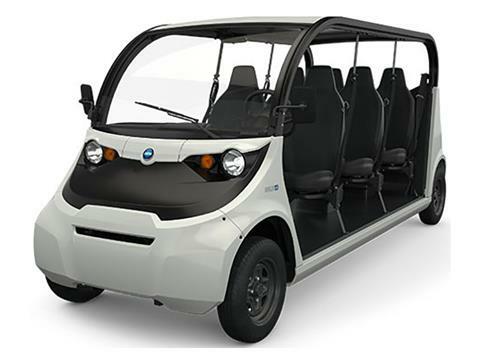 The roomy e6 shuttles up to six people, with an enhanced suspension that accommodates more weight without compromising comfort. Choose from handy under-seat storage and carrier options, too. STREET LEGAL: GEM has DOT required features to be street legal on roads posted up to 35 mph in most states and provinces. EXCEPTIONAL PASSENGER EXPERIENCE: Transport your passengers with style and comfort. GEM e6 has extra legroom, high back seats and almost 6 inches of suspension travel to make for a memorable ride. LOW COST OF OWNERSHIP: GEM vehicles have low maintenance costs and an average operating cost of $0.03 per mile, significantly lower than full size combustion vehicles like trucks or vans. SUSTAINABLE TRANSPORTATION: With all-electric power not only does GEM save you money, it appeals to an ever-growing, environmentally-conscious customer base. SAFETY FEATURES: GEM vehicles come standard with an automotive grade windshield, 3 point seatbelts, LED turn signals, and other safety features to make your ride feel more secure. CUSTOMIZABLE: GEM offers numerous options such as cargo carriers, batteries, and doors to make your GEM perfectly fit your application.